Fiology thanks Grumpus Maximus, the pension expert of the FI community, for shaping this lesson. In the U.S., prior to the 1980s, a company or government Defined Benefit Plan (DBP), commonly referred to as a pension, was potentially all a person needed for retirement. Times have changed. DBPs are now found in a few private sector industries and government work at the federal, state, and local level. Outside the U.S., various forms of DBPs are still common, but they too are coming under fiscal pressure to varying degrees. Utilizing a pension to help achieve FI does not come without cost or risk; especially since not all pensions are created equal. While some pensions start immediately upon “retirement”; others start at a certain age, or time frame, in the future. Some pensions provide healthcare; others don’t. Many private and some public sector DBPs face serious questions about their financial safety or solvency. As a result, reliance on a DBP for part of an FI plan requires serious consideration. 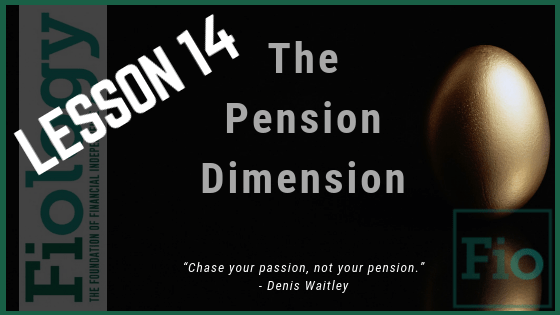 Fortunately, these types of calculations can be made, and several FI bloggers have paved the way on methods for valuing a pension in order to achieve FI. Take Action: If you’re eligible for a pension, take the time to understand the specifics. What is it worth to you? Consider whether or not it should be part of your FI plan. Read: Boston College’s Center for Retirement Research numerous articles and searchable database on U.S. public and private sector pensions.